"The intertwined roots and branches of the Tree of Life weave together without end. This is the glorious cycle of life on earth." Our Celtic Tree of Life Tote bag comes from the famous Mucros Weavers of Co. Kerry, Ireland. It's just the thing for a busy day out and about, a weekend get-away...or the journey of a lifetime. 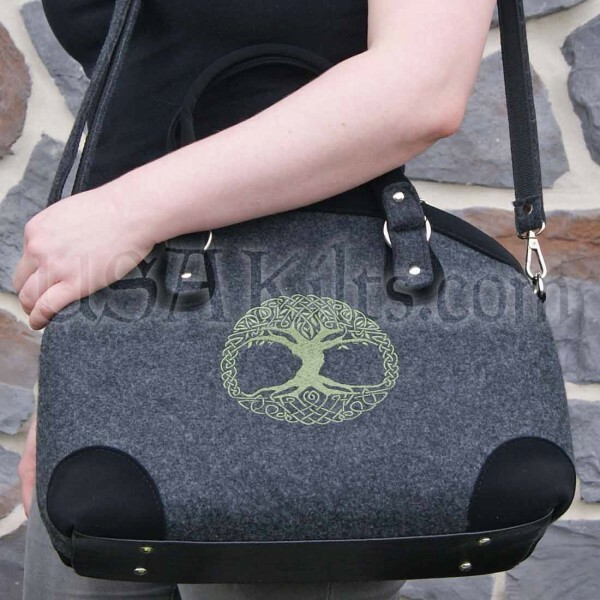 Built from sturdy yet soft natural grey boiled wool with attractive faux suede trim and comfortable handles. The ancient Tree of Life is embroidered in bright emerald green satin. Chrome steel double-zippers and hardware. Removable shoulder strap extends to 45". Measures approximately 15" x 12" x 6" -- plenty of room for all your necessities. Two open pockets and one zip pocket on the interior keep them organized. Quick-access zip pocket on the back for your wallet, glasses, etc. This will become your go-to bag.